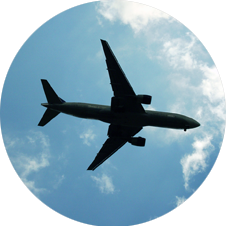 Logistics Plus® provides customized supply chain solutions for the aerospace, aviation and defense industry. Logistics solutions for the aerospace, aviation and defense industry. The aerospace, aviation and defense industry is facing escalating commodity prices, increasing competition, stricter safety regulations and higher value inventories. You need reliable and cost-effective logistics services across all segments of your supply chain, from managing the inbound flow of goods into production plants to providing spare parts for aircraft on ground. 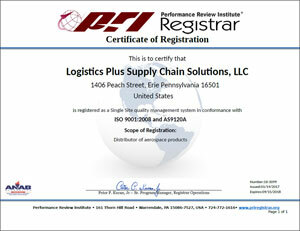 With our ISO 9001:2008 and AS9120A certified quality system, Logistics Plus Supply Chain Solutions can help you provide greater control to optimize inventories and increase efficiencies across all aspects of your supply chain. We actively manage supply chains to reduce cost and inefficiency, clarify processes, and improve delivery accuracy. Our people and services are geared toward simplifying the most complex aerospace and aviation supply chains. Logistics Plus experience includes recent logistical coordination of U.S. and European raw material supply to be built into major helicopter sections by a fast-growing company in Bangalore, India for final assembly by the aircraft manufacturer in the U.S. We’ve also has a long-standing, on-site 4PL relationship with Lord Corporation, a major aerospace and defense supplier. Our dedicated and experienced aerospace and aviation staff can help manage your logistics so that you focus on your business and respond quickly to changing market conditions. With peace-of-mind assurance, you can spend more time on the things that ultimately make you more competitive, like service, productivity and innovation. To request more information, please complete our Industry Solutions Form.